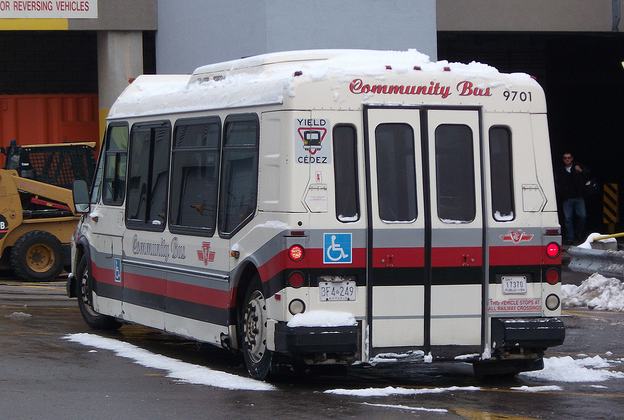 What is the plate below the TTC logo? Ontario Public Transit plates (IIRC). The existing tracks at Obico are set in concrete / asphalt, so no, not without ripping them out anyways. Anyone know why TTC still hasn't updated 186 to 996 and cancelled the 193? 193 still shows on the schedule on its page. Yes, 3100-3329 have the LCD screens now. 3330-3369 were delivered with them preinstalled. Is there any timeline as to when the display will be fixed up on them? I expect the displays to look as dull as they currently do for the life of the displays (similar to how bad the displays on the TRs still look). The TTC has a history of over promising when it comes to these kind of things, and in the end they dont even try to improve it. Thats unless a student comes to the rescue and pitches a way to improve them, similar to how a student who was employed with the TTC improved the next vehicle displays on the subway system. Nevertheless, the displays as they currently stand look pretty bad. Sorry, hang on a sec here. We got these fancy new LCD screens to do the exact same thing that the old displays did? There isn't even a plan in place to increase their usefulness? I'm not saying that there wont ever be a plan, but as of now there's nothing concrete in the books. So far it's all just hearsay, similar to the same fluff talk happening when the TRs were first placed into service. In my view, I dont think we'll ever see them becoming more useful just knowing what the TTC typically does. I'd love to see them prove me wrong. Placing some ads is one of the discussions that have been going around. As for system alerts, that would be the kind of information that would actually be useful to riders but seeing as that makes far too much logical sense to place on these screens, I can bet you the TTC wont be implementing that. How does the TTC get away with subway car maps or service disruption posters, or station information boards? This years TTC's Doors Open Toronto 2019 will be held at Bay Lower Station on May 25, 2019. 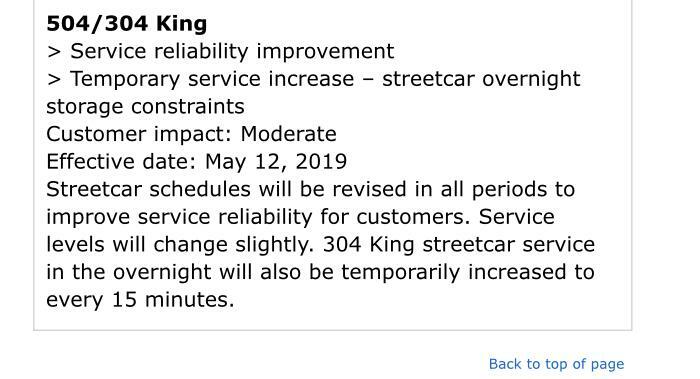 Why are there overnight streetcar storage constraints starting in the May board period ?? Running out of space in Ronces and Leslie, Russell not ready to dispatch LFs, don't want to pay to secure Ex Loop? According to Steve Munro in a twitter message this evening, he is writing a blog post wherein he reports TTC planning to operate such service until 2025. Does anyone know what's going on with construction at Kipling? Passing through yesterday and noticed they were working on the abandoned RT trench opposite the bus platform (new/cleaned metal cladding on the side and then new/cleaned paving on the ground). Are they expanding the TTC bus platform or is there something else going on? A new terminal is being built for Mississauga Transit and GO Transit buses. As part of that, they are eliminating some parking, and reworking the kiss-and-ride. This isn't at the old kiss-and-ride - that's been completely fenced off to the public while they build the new intercity terminal. This is the trench that's attached directly to the main TTC bus terminal (inside the fare-paid zone). I'd be surprised if they shifted either the MiWay/GO terminal or the kiss and ride to a spot where people could just enter the system without paying a TTC fare.